At the risk of being wrong (again), sixtrack had a server upgrade on 3/26/2018. Your stat counter for that site has not updated since then. I was pulling the stats for this project from: https://lhcathome.cern.ch/sixtrack/stats however, this does not appear to be a valid URL. I can't see where they have moved them to. Sorry, but I don't know anything about such links. If I recall, ALL LHC info was consolidated on ONE server/website https://lhcathome.cern.ch/lhcathome a while back. 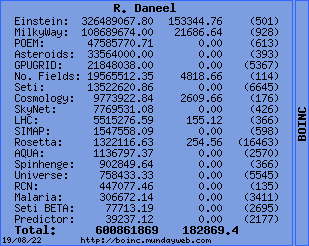 I would guess Stats would be in the default BOINC location for them. Having gone back through my scripts etc. I've re-enabled the LHC stats (which are now up to date) and I have disabled SixTrack as I assume credit accumulated for SixTrack is included in the LHC stats?